The tenant rights in California are more generous than in many other states of the U.S. Landlords in California must not forget that being a landlord is a business, and if they don’t take serious actions and steps against the non-paying tenants, their businesses will eventually suffer. This is particularly true of Los Angeles, California landlords that have some of the stricter rent control statutes in the country. If you are a landlord in California who have not employed a management company to collect rents, you must be in a similar situation. What can you do in such a situation? Will you immediately post a 3-day notice to pay the due rent? Or will you call and have a word with the tenant before taking such steps? How long will you wait before your tenant will come up with the rent? For a week or for a month? Landlords in California must rethink and ask themselves these questions. Los Angeles, California landlords are supposed to register their rental units with the local housing department. If the landlord fails to register the unit or fails to provide the tenant with a copy of the Certificate of Registration, they may not be allowed to provide a 3-Day notice or file an eviction action. No landlord wants this to happen. So, it’s better to take these details into consideration before starting the whole rental process. If your tenant is not paying you as per the agreed terms, you have every right to evict them. But before you start with the process, you need to issue a three-day notice to pay rent or quit and a proof that it was properly provided to the tenant. Most of the free forms available online will not prove your case in the court if the tenant challenges; hence, it is recommended to acquire one from an unlawful detainer attorney. If the tenant does not pay the rent within three days, the landlord has every right to file an eviction action which requires the preparation of Civil Case Cover Sheets, a Summons, a Complaint with all the appropriate attachments, and a Prejudgment Claim of Right to Possession. The court filing fee for Los Angeles, California landlords is now between $245 and $270 depending on whether or not it is fax filed, and the service fee for the process is typically between $100 and $150. In all cases, landlords must note down the date and time at which the notices were served. Let your tenants make a security deposit first. It should consist the first month’s rent and two months’ security deposit. The security deposit is for any damage the tenant may have caused to the rental’s property. A Late Rent Fee is acceptable only if it is set forth in a written agreement or if it is reasonable. A late fee of up to 5% can be tolerated by the landlord in most cases. Late Rent Fee should never be included in the 3-day notice to pay rent or quit. On such occasions, the notice will be invalidated. If the tenant continues to have a fixed term lease at the end, the lease would either end or go month-to-month based on how the lease is documented. In some cases, the tenancy ends unless the tenant pays rent and the landlord accepts it. In such cases, the tenancy continues on a month to month basis, keeping all the terms of the original lease intact (Civil Code § 1945). But if the lease specifically states that the tenancy will end since the landlord wants to end it, the landlord has the rights to possess till the conclusion of the term and may start eviction proceedings if the tenant fails to vacate (Code of Civil Procedure §1161). However, there is an exception. 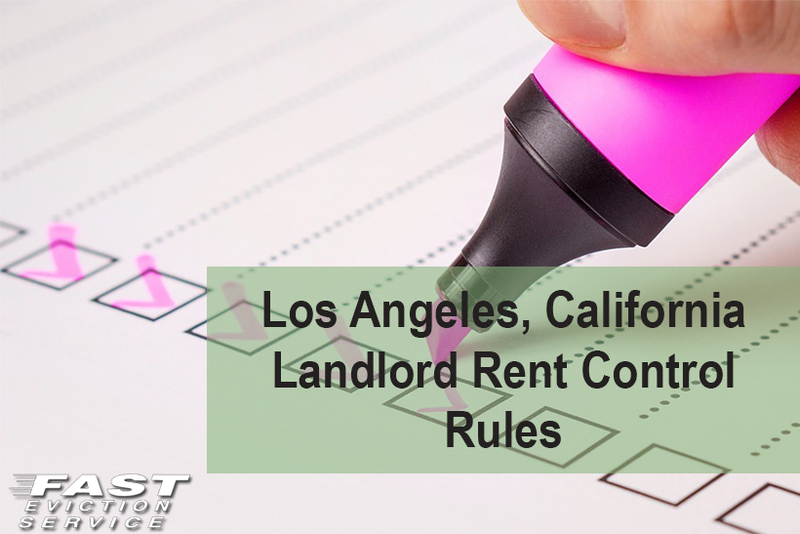 If the unit being rented is under rent control in Los Angeles, California the landlord will not be allowed to end a fixed term lease; either the lease will be renewed for the same period or the tenant will become a month to month tenant still subject to the terms of the original lease. As stated above, landlords in California and particularly in cities with rent control such as Los Angeles are requested to be much more careful and protective about the business they do. The above-mentioned content suggests all the legal measures a Los Angeles landlord is eligible to take in case of non-payment issues created by their tenants.